You want to talk and even sing like your favorite celebrities and idols, surely you will need to practice hard with no guarantee to a mission accomplished. But, what if I tell you that there is another way worth your trying? 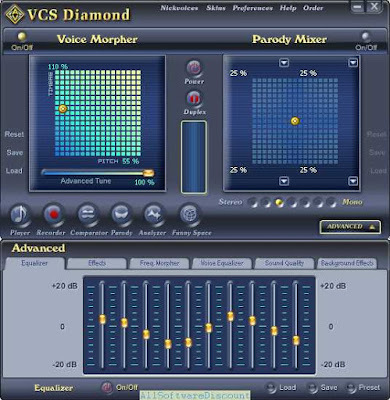 As you may know, AV Voice Changer Software Diamond has an extended feature called Voice Comparator which is specialized in comparing your voice with one another (for example, your favorite celebrity, your idol) and give you analyze on how close is your voice to his/her voice. More important than that, the program will also recommend you the best settings for Voice Morpher (Pitch and Timbre parameters) so that you can talk like your celebrity and idol instantly. 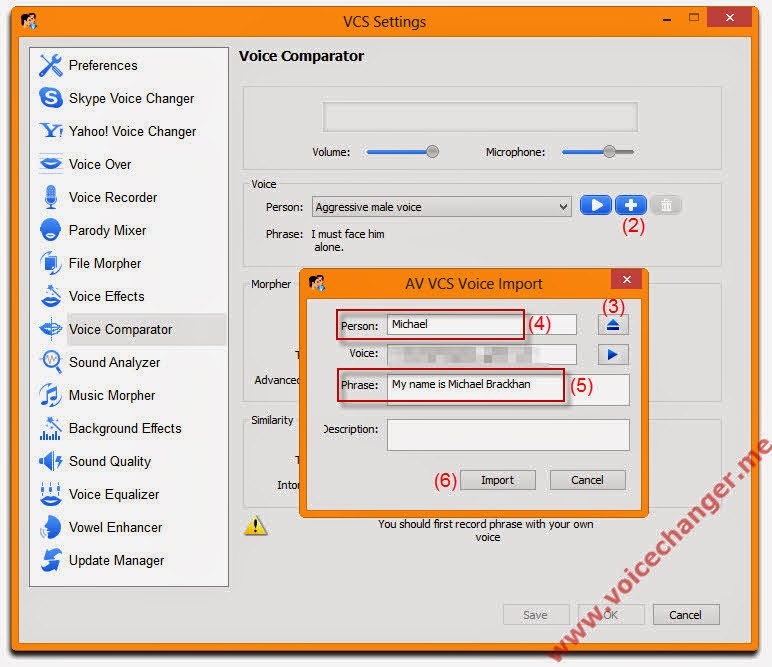 Click on Preferences (2) to open the Settings window » select Voice Comparator tab within the left panel of the Settings window. Hit Add (2) button to bring the AV VCS Voice Import window up » hit the Browse button (3) then locate & select the celebrity's voice file or the idol's voice file you want to imitate. Enter the celebrity's name into Person box (4) (for example, Michael, Morgan Freeman, Optimus Prime Transformer, Obama, Bi Rain, etc). Enter content (what the celebrity say) into the Phrase box (5). ** Beside the name for the voice, the other info is not required. Hit Import (6) button to finalize this step. Hit the Record button (8) and speak into the microphone exactly the same content as entered into the Phrase box (5) in the above step. As soon as the program get enough data for the analyzing process, the recorder will stop immediately and a short message from the program (11) would display to describe how close is it when comparing your voice with the input celebrity's voice. If you get the message saying that "Cannot make comparison. Please, try to record your voice again" try the tips below. Try to keep your voice clear and loud enough (A good headphone would be in help). Start speaking right after hitting the Record (8) button. Try to 'perform' your voice and tone to imitate the target's voice as close as possible during the recording. Otherwise, the comparison is completed. You can now hit the Auto Compare button (9) to let the program calculating and suggesting the appropriated pitch & timbre's parameters to make your voice sound like the celebrity' voice or idol's voice. ** You can force the comparison process running again by hitting the Compare button (12) manually. 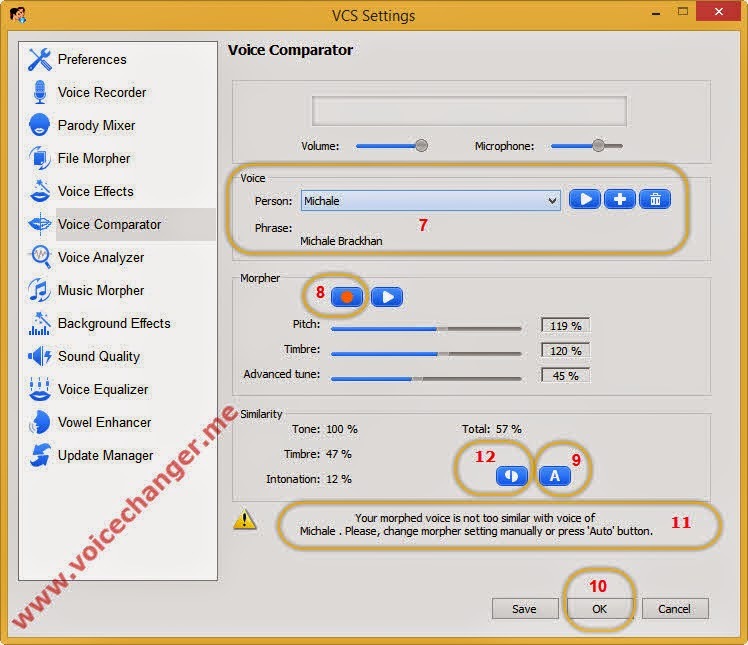 Now you can close the Voice Comparator and back to the program's main UI. The pitch and timbre you get from the comparison process is now apply into the Voice Morpher. Please kindly notice that each voice is characterized on many factors for example, pitch, timbre, tone, loudness, vibrato, tremolo, etc. To be totally sound like anyone without any special skill or voice talent is a very hard mission. So, take it easy and enjoy! 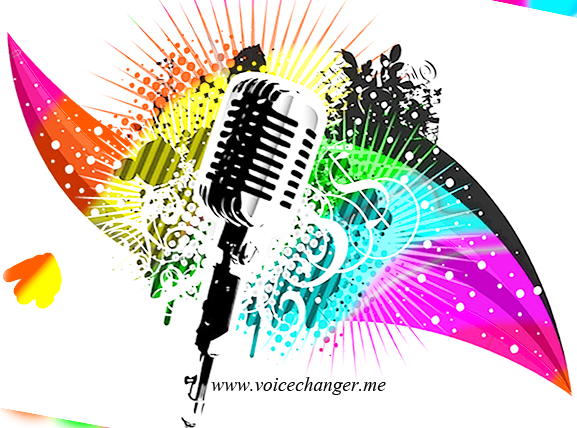 Buy Full version of the celebrity/idol voice imitating program (AV Voice Changer Software 8.0 Diamond) now!